This is a gentle TRX workout is great when you are not feeling 100% but still, want to exercise. A question I get all the time is should I exercise when I am sick? The answer is not that easy. It really depends on how you are feeling. If it’s something like the flu then the answer is no stay in bed. If you are just getting over a cold or maybe have a low energy day I say use your judgment and really tap into how you are feeling. Always listen to your body, it knows the answer. Giving the body a rest from exercise is a great thing to do. You will come back fully recovered and strong. 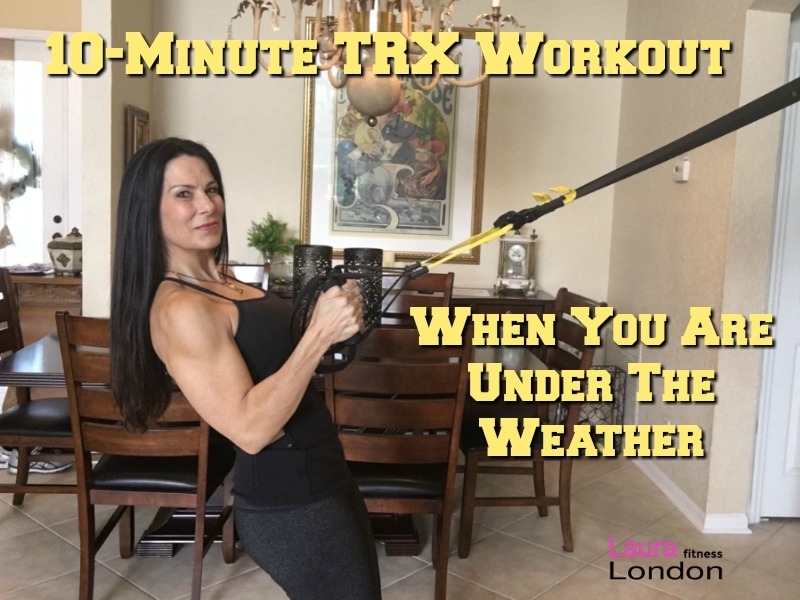 Sometimes though, you want to do a little something and this gentle TRX workout is perfect for those days. I have another great gentle stretching video that I know you will love too. I love, love, love the TRX. I actually have it mounted to the wall in my dining room. The hook doubles as a picture hanger so when I am not using it I just pop the picture back on the wall. The TRX also comes with a door attachment so you can use it in any doorway. I use the TRX with my training clients and bring it to their homes and just set it up and we are ready to exercise. The TRX uses your own body weight. You can perform hundreds of exercises that build, burn, tone, and strengthen. It uses many different muscle groups at the same time and you know I love quick and efficient workouts.